Yesterday, we explored Flowers on the Worktable, so today let’s look at Flowers in the Office. Health studies suggest that flowers may actually have health benefits. Renowned American Botanist, Luther Burbank claims that flowers always make people better, happier, and more helpful; they are sunshine, food and medicine for the soul. 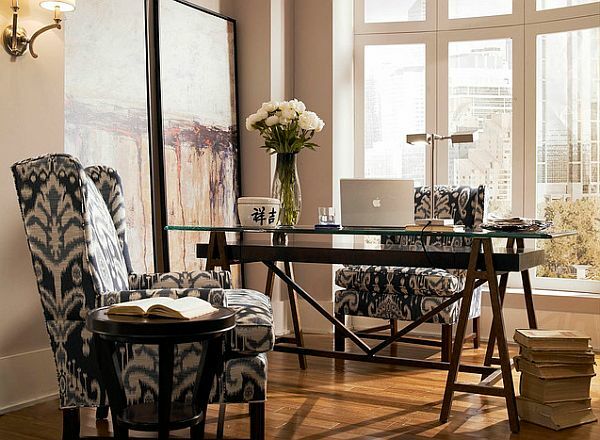 So what better place to have florals in your daily life than the office. A good rule of thumb when selecting office florals is to use a narrow vessel so the arrangement doesn’t take up precious desk space. I also like to use florals that don’t shed pollen all over the desk…which are usually round/rosette shaded flowers such as tulips, roses and ranunculus. Large green leaves and/or tropicals work well too. Just a simple cylinder vase with white tulips adds so much life to this space. Imagine how this space would look without the fresh florals. It would be bland and uninviting. But instead the flowers welcome you into the space. The green stems complement both the office space walls but also the purple wall in the other room. The white blooms pull it all together. Red tulips could also work well in this space. This clean modern space holds a few desk florals in red for a pop of color, as well as a few green plants for a life force. 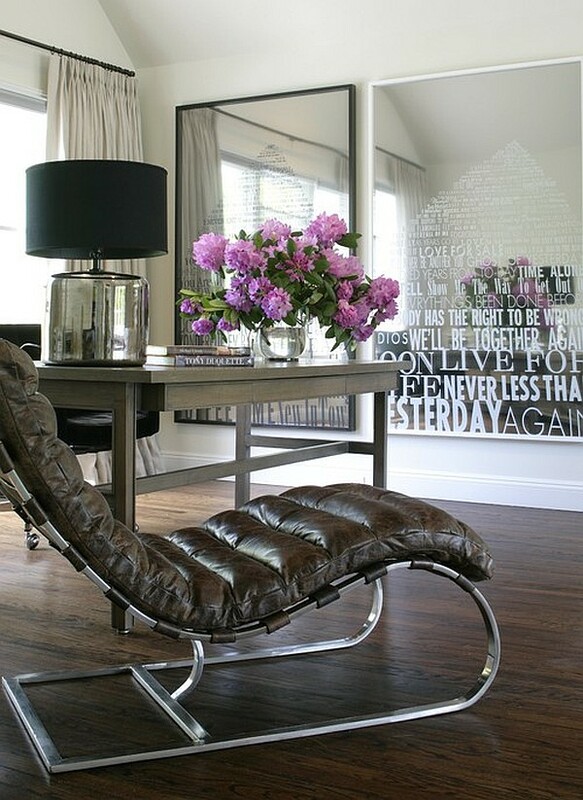 This tall vase of flowers here brings the eye up and gives the desk a focal point. When you walked into this space, you would hardly notice the laptop…you would notice the florals…which in turn, compliments the large wall art to the left. A two-fer-one here. One large monstera leaf is all that is needed in this retro office space. The green compliments the orange nicely. And once again, imagine this space with and without the leaf. It’s sooo much better with the leaf. Just by adding this one living thing, it brings life and presence to the space. Now these florals don’t really follow my general guidelines of slim vase with non-shedders, but I wanted to add it to show that there may be a time and place for large and lacy. You can see that the items in the room feel round and wide, so the florals match the shapes of the room very nicely. The purple-pint hues of the florals greatly complement the blacks/browns of the room. 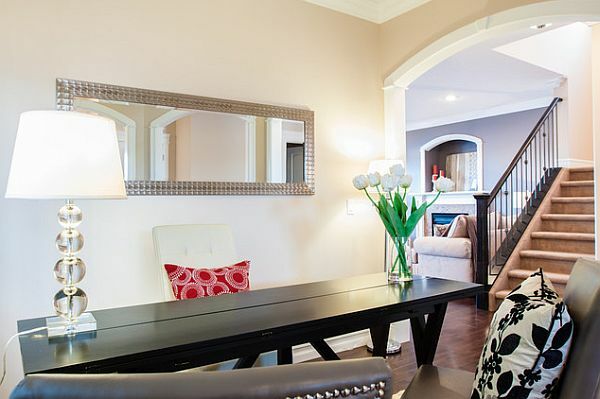 The arrangement adds a wonderful pop of color and creates an extremely welcoming space. Alrighty then. Now I hope you feel inspired to go dress up the office with flowers. May they inspire you to do great work!